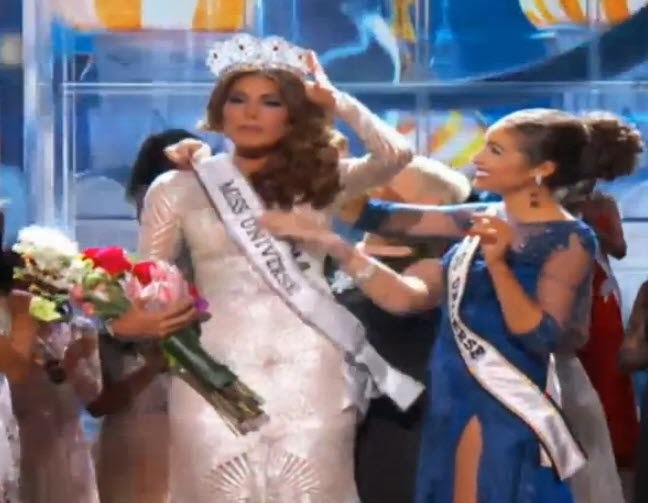 Miss Venezuela Gabriela Isler was crowned the new Miss Universe in the finals night held November 10 (2am in Manila) at the Crocus City Hall in Moscow, Russia. Check out Miss Universe 2013 Question and Answer HERE. Check out Miss Universe 2013 Top 10 HERE. Check out Miss Universe 2013 Top 16 HERE. Dubbed as “Magkasama Tayo sa Kwento ng Pasko,” this year’s Christmas SID becomes a vehicle to share these stories to Filipinos here and across the globe. It also highlights the bond that ABS-CBN have forged with its audience through the years. Seven stories were meticulously researched by ABS-CBN’s Integrated Creative Communications Management division and for each story, an artist was chosen based on who would best help tell their touching true-to-life tales. “These stories of simple yet remarkable individuals will always be ABS-CBN’s inspiration in delivering its commitment to be of service to every Filipino. And for the many years that they have allowed us inside their homes, we only have gratefulness. Being accepted by Filipinos as their Kapamilya is by far our greatest achievement. Our journey with them has been remarkable. We can only look forward to many more years with them,” said Head of Integrated Creative Communications Management Robert Labayen. Nanay Baby of Isla Pulo ‘s only wish for Christmas was to have an autographed picture of Kim Chiu, the actress who stayed in their humble home (which didn’t have any electricity) for an episode of the show “I Dare You” two years ago. She was definitely in awe when the one who delivered her requested photo was Kim Chiu herself. Together with Xian Lim, Kim reconnected with Nanay Baby, whom she considers like a mother in that short span of time she lived with her family. 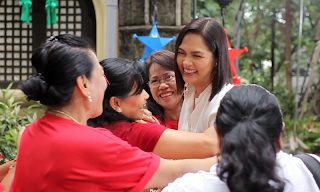 Judy Ann Santos expressed that she wants to spend time with women who were victims of violence, having portrayed an abused wife in her last teleserye “Huwag ka Lang Mawawala.” The women of Women’s Crisis Center were brought to Our Lady of Victory chapel in Malabon knowing that they will be interviewed about their past experiences and how they have moved on not knowing that Juday will be there waiting for them. The actress sat down with them, talked with them and even served them a simple merienda of pancit, chicken and puto to the women’s delight. 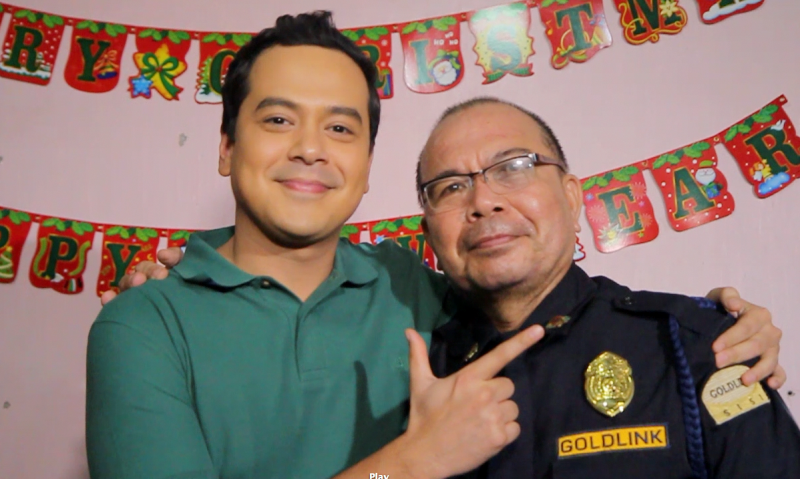 Gualberto Isla Jr. is a security guard of the Star Magic office in ABS-CBN, who opens the door for artists like John Lloyd Cruz, who drop by the office. Unfortunately, he had to be relieved of his duties due to malignant melanoma which affected his left under-eye area. His simple wish was to be able to go back to work so that he can provide for his family. One rainy afternoon, an unexpected visitor entered Guard Isla’s home in Rodriguez, Rizal and it was none other than John Lloyd Cruz himself. Meanwhile, Cyril Perales is a habal-habal driver in Cebu who hardly make ends meet together with his wife Evelyn to support their seven children. Though life is tough for them, they take pride in having a happy family with simple joys. They save up for two months just to be able to cook spaghetti and buy bread for Christmas dinner. 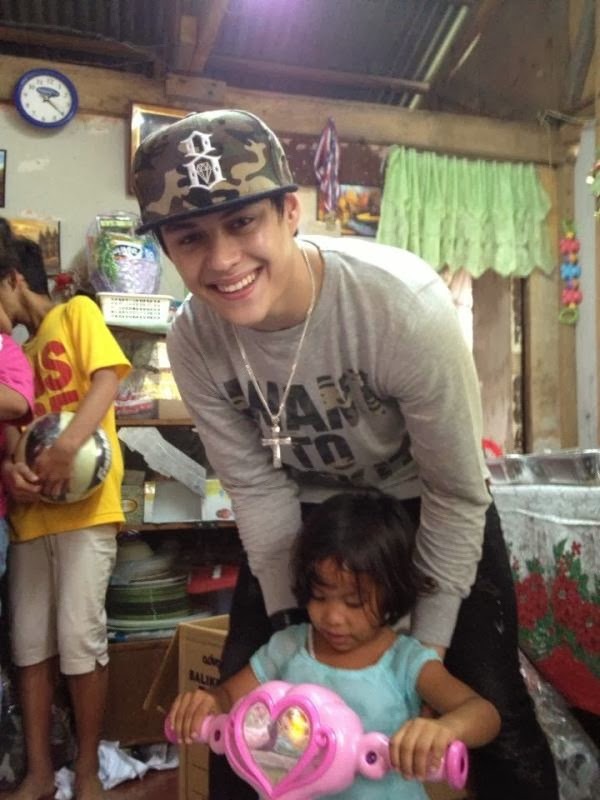 Having heard this story, Cebu-born actor Enrique Gil flew to Cebu, with several balikbayan boxes containing gifts for all nine family members. Not only that, Enrique also surprised the whole family with their first ever Noche Buena feast, complete with the famous lechon Cebu. Gemma Solomon is an OFW in Hong Kong who battled breast cancer. Though she was longing for the care of her family back in Bicol, she decided to stay in Hong Kong because of the medical benefits the government provides for foreign workers like her. Like any other mother who wants to provide for her children, she fights homesickness every day, in the hope of giving them a better life. When Piolo Pascual heard about Gemma’s story, he agreed to fly to Hong Kong immediately, carrying with him a video message from her family. Gemma could hardly believe that the actor appeared right before her eyes on a random Sunday morning at the Hong Kong harbor. Simplicio Yoma is a war veteran living in The Bay Area in California who misses his family back home in the Philippines. 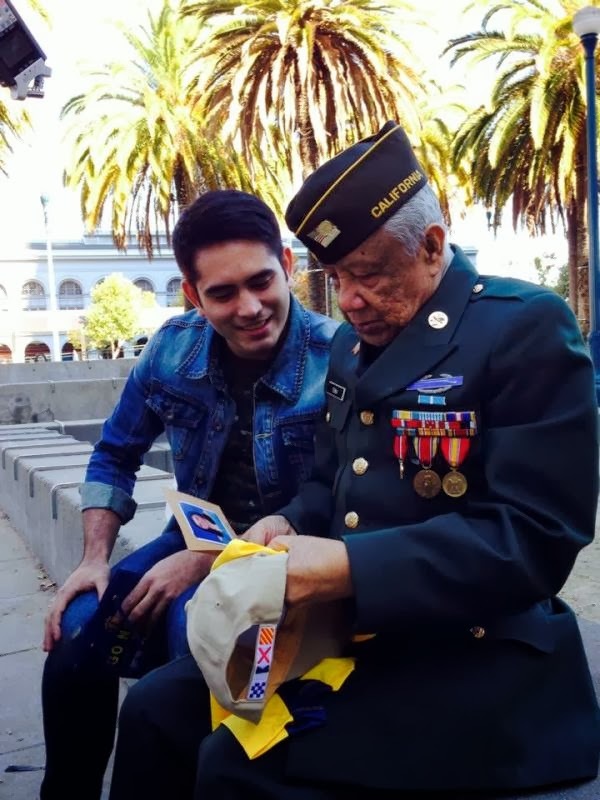 One day at the Embarcadero in downtown San Francisco, Gerald Anderson came up to him and surprised him with a video message from his family. It is a very personal moment for Gerald since Gerald’s father is also in the military. An avid TFC subscriber, Nanay Dely thought she was only visiting Sam Milby’s shoot in downtown San Francisco. Without her knowledge, her husband Tatay Fermin was about to fulfill her long-time dream that day – a marriage proposal – as they celebrate their 50th anniversary. 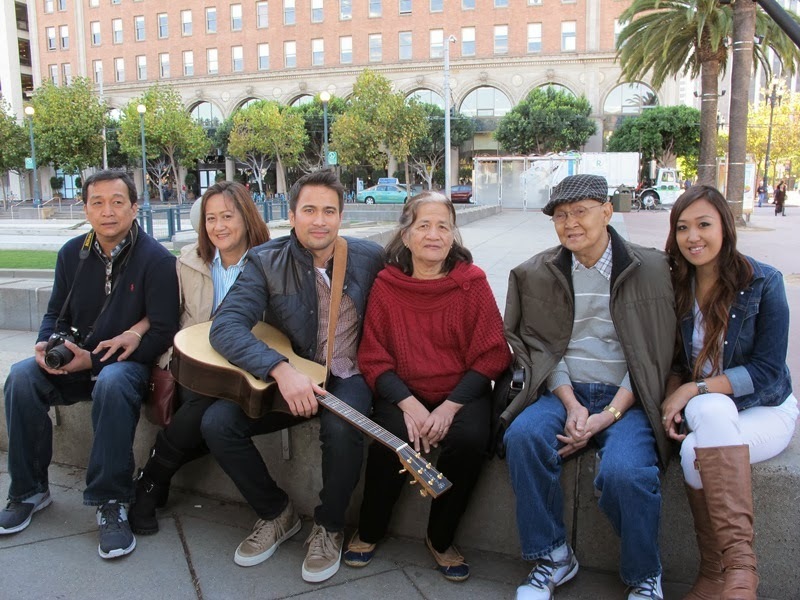 With the help of Sam Milby, Tatay Fermin started to carry out his plan by serenading Nanay Dely with their theme song, “Portrait of My Love.” Holding out a placard saying, “Minahal at inalagaan mo ako nang higit sa iyong sarili. Pakakasal ka ba sa akin MULI?,” atay Fermin broke into tears even before Nanay Dely was able to give her resounding, “yes” A true testament of love and devotion, they now plan to get married again this December. “Magkasama Tayo Sa Kwento Ng Pasko” was written by Robert Labayen, with music composed, arranged and produced by Bojam De Belen, Thyro Alfaro, Jeli Mateo. It was performed by “The Voice of the Philippines” coaches Sarah Geronimo, Bamboo and Lea Salonga with grand winner Mitoy Yonting and finalists Klarisse De Guzman, Janice Javier, Myk Perez. The 2013 ABS-CBN Christmas Station ID was created by ABS-CBN Integrated Creative Communications Management headed by Robert Labayen, Johnny Delos Santos, Patrick de Leon and Ira Zabat. It is directed by Johnny Delos Santos, Peewee Gonzales, Paolo Ramos, Carmelo Saliendra. The SID Creative and Production team members are Danie Sedilla-Cruz, Edsel Misenas. Kathrina Sanchez, Dang Baldonado, Sheryl Ramos, Love Rose De Leon, Christine Joy Laxamana, Carlota Rosales, Adrian Lim, Christine Daria-Estabillo, Christian Faustino, Mark Bravo, Shally Tablada, Jill Cabradilla, Madelle Balendo, Raywin Tome; with ABS-CBN Marketing’s Cookie Bartolome, Zita Aragon, Micah Rivera; ABS-CBN TV Entertainment, News and Current Affairs Division, Regional Network Group, ABS-CBN Global, Human Resources Division, Property Management Group, and Safety and Security Division. Other members are Jaime Porca, Technical Production head; Rommel Andreo Sales, Director of Photography; Nere Ku, Production Designer; Oliver Paler, Karlo Victoriano, Bridge Sulit, Danica Rueda, Maria Concepcion Ignacio, Post Production Team; Mary Ann Rejano, Remy Sotto, Talent Casters; Marvin Bragas, Location Manager; Jojo Medrano, Jen Esber, Production Coordinators. The awards night is set on November 24, 2013, Sunday, 6 p.m., at the AFP Theater, Camp Emilio Aguinaldo, Quezon City and to be hosted by sisters Toni and Alex Gonzaga and Gutierrez twins Richard and Raymond. With taped telecast on ABS-CBN Sunday's Best on December 1, 2013. 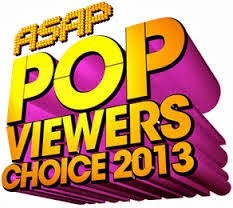 “ASAP 18” has released the full list of nominees for the much-anticipated "ASAP Pop Viewers’ Choice Awards 2013". Cast your votes using Chalk and StarStudio Magazines POP Balota. 1 ballot is equal to 10 Votes. Drop your entries at selected National Bookstores, ABS -CBN Studio Tours and Tower Entrance , ABS-CBN Regional Network Group offices. 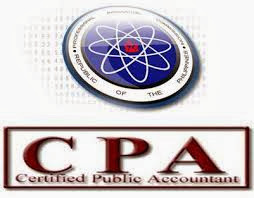 The Philippine Regulations Commission (PRC) and the Board of Accountancy officially release the results of October 2013 Certified Public Accountant (CPA) board exam. The October 5, 6, 12 and 13 CPA licensure examination was administered in the cities of Manila, Baguio, Cagayan de Oro, Cebu, Davao, Iloilo and Legazpi by the members of the Board of Accountancy Atty. Eugene T. Mateo, Chairman; Dr. Rufo R. Mendoza, Vice Chairman; Luis A. Cañete and Jose S. Tayag, Jr.